It’s been a while! Like, quite a while.. ! But we’re back, yet again, with updated content all across the board. We also just released the Land Upgrading Guide, Hiring Other Players Guide, Facilities Guide, Tools Guide, Levels and Unlocking Guide, Fishing Guide, Trohpies Guide & Harvesting Livestock Guide. That’s a lot of stuff for you to read through, and we link to some impressive charts for your viewing pleasure as well. BUT WAIT, THERE’S MORE! We’ve also added the Livestock & Fishing Datasheet and the Buildings & Facilities Datasheet, plus updated the Grow Time Charts page with a new (working) link! Hopefully this little update is well-received, and check back soon! 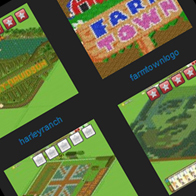 Also, the Farm Gallery has been updated and corrected to allow any of our users to upload to it, and we’ve added a new commenting system that makes it so you don’t even have to register to post! You can now post comments on Farm Town Guru logging in from Facebook, Twitter, Google, Yahoo, Disqus or OpenID accounts! We also enabled a rating system, similar to YouTube’s likes, which we think will make the entire commenting/discussion process much more entertaining! Yeah, YEAH! You’re excited, you’re pumped, you’re uh, I’m out of things you are..
Anyways, I got the Farm Gallery up now with our SWEET new website layout, so I want you guys to start uploading pictures of your farms! You must Register to be able to upload your farm! Check back super soon, tons of updates coming. PS. We’re still looking for some website mods / writers / admins, use the contact form to get in touch with me. We need your help in regaining traffic to this site, what can you do to help? You’re only one person?! Tell your friends obviously! Word of mouth is more powerful than you think.. So please spread the love and let fellow Farm Towners in on the secret! PS. Forums will be restored soon! Yeah, that’s right.. it’s time for the new & improved Farm Town Guru! It was a long time in the making but it’s finally here, sign up to the forums and introduce yourself or add your Farm to our Farm Gallery! Anyways, welcome to FarmTownGuru.com! The company we were getting hosting through randomly suspended our account and isn’t responding to any e-mails I’ve sent them regarding it. So I’ve switched to a new faster server hosted by KlikTAB Media. The site is going to be a little buggy for a while, so bear with me. The forums are currently down, as is the Farm Gallery, but we’ll have it back online very soon! Keep checking for updates. We’re also looking for Site Staff to moderate the Forum & Farm Gallery, and Authors to post news to the main page!